Jim Bridenstine, seen here at his November confirmation hearing, will be sworn in as NASA administrator April 23. WASHINGTON — NASA's next administrator, Jim Bridenstine, was sworn into office April 23 as the space industry breathes a sigh of relief that his extended confirmation process is finally over. NASA announced late April 20 that Bridenstine would be sworn in as NASA's 13th administrator in an April 23 ceremony at NASA Headquarters. Vice President Mike Pence officiated the proceedings, and the two will also spoke with the three NASA astronauts currently on the International Space Station. That long-awaited confirmation has been warmly received by companies and industry groups who had supported Bridenstine's nomination, in large part because of his track record in Congress. Bridenstine, first elected to the House as a Republican from Oklahoma in 2012, quickly became a leading figure in space policy through such legislative efforts as the American Space Renaissance Act. "Bridenstine has been a champion of civil, commercial and military space policy during his time in Congress," said Jim Maser, president of the American Institute of Aeronautics and Astronautics (AIAA), in an April 19 statement. "AIAA looks forward to supporting him in his new role as we strive to maintain our nation's leadership in space exploration and scientific discovery." "Bridenstine is one of a growing group in Congress that fully appreciates the importance of space commerce and space resources to the human future," said Bruce Pittman, senior vice president of the National Space Society, a space advocacy group, in a statement. "We look forward with great anticipation to working with Administrator Bridenstine to lead America back to the moon and to develop a thriving economy in space." Both established and entrepreneurial sectors of the space industry said they were pleased Bridenstine was confirmed. 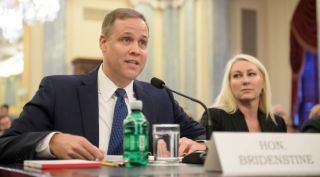 "The Coalition and its member companies stand ready to support Administrator Bridenstine as we take the next steps in the exploration of deep space, returning to the moon and going on to Mars," said Mary Lynne Dittmar, president and chief executive of the Coalition for Deep Space Exploration, a group that represents companies involved in NASA's human space exploration programs. "Since he was elected to Congress, Rep. Bridenstine has been a constant champion and advocate for the space industry," said Eric Stallmer, president of the Commercial Spaceflight Federation. "His knowledge and passion for space, science and technology will serve him well in the position of administrator." Other advocacy groups also weighed in. "We look forward to working with him to explore space, advance space science and search for life on other worlds," said Bill Nye, chief executive of The Planetary Society. Nye attended the State of the Union address Jan. 30 as the guest of Bridenstine. "The Mars Society offers you its full support in any effort you make to give the American people a purpose-driven space program that is really going somewhere," said Robert Zubrin, president of The Mars Society. While Bridenstine has won support from much of the space industry, others criticized his confirmation as NASA administrator. Those critics include those who are worried about Bridenstine's views on climate change, views that Bridenstine said at his November confirmation hearing have changed over time. "Scientific integrity matters at NASA. I hope the new administrator begins to listen to career employees rather than engage in political grandstanding," said RL Miller, political director of Climate Hawks Vote, a climate change advocacy group, after Bridenstine was confirmed. "I hope he doesn't follow through on his bill, written as a member of Congress, to end NASA's Earth science research." That comment appears to be a reference to language in one version of his American Space Renaissance Act that would amend the objectives of NASA in federal law to no longer explicitly include the "expansion of human knowledge of the Earth." As administrator, Bridenstine would not have the ability to unilaterally end Earth science research at the agency. Democratic senators, who voted as a bloc against Bridenstine, also expressed concern about Bridenstine's experience and positions on science issues. "While this nomination is problematic due to Congressman Bridenstine's lack of relevant qualifications and the importance of this position to our nation, I am deeply concerned that his nomination is further evidence of a deeper problem," said Sen. Gary Peters (D-Mich.) in a speech on the Senate floor prior to the April 19 vote. "I am concerned that this Administration does not respect science, especially science in government institutions." Sen. Brian Schatz (D-Hawaii) said that Bridenstine was unqualified to run the agency, expressing particular concern over his judgement in his role to provide "final launch authority" for a mission. "Remember the part in the astronaut movie when the unqualified former member of Congress running NASA saves the day by making the right decision regarding a launch? Me neither," he tweeted as the Senate voted to confirm Bridenstine. Sen. Bill Nelson (D-Fla.) was one of the strongest critics of Bridenstine's nomination because of his qualifications. In comments on the Senate floor April 18, he reiterated his opposition to Bridenstine, but also took a more conciliatory tone. "I hold nothing against him personally. He's a very likable fellow. My decision is not politically motivated," he said, adding that he backed the nomination of Jeff DeWit as NASA's chief financial officer in March. "And, of course, if Congressman Bridenstine is, in fact, confirmed, I will work with him for the good of our nation's space program."